A permanent Dutch settlement was established at Fort Orange (now Albany) in 1624. The following year Peter Minuit bought Manhattan Island from the Indians in exchange for some objects worth about 60 Dutch guilders and founded the Dutch colony of New Amsterdam (now New York City). It is difficult to calculate how much this would be worth in modern times and estimates vary between $1000 and $19000 but in any case it was extremely cheap. The Indians had no concept of property ownership at that time and did not fully understand what it was to own land. New York City is famous for its skyscrapers which are concentrated in Midtown and Lower Manhattan. There are 5,845 high-rises, 98 of which are higher than 600 feet or 183 m. The tallest building in New York is One World Trade Center, which is 1,776 feet or 541 m. One of the most famous skyscrapers is the Empire State Building 1,250 feet or 380 m. It was the tallest building in New York between 1931 and 1970. In 2014 the population New York City was almost 20 million. There are more than 26,000 people living in each square mile. 51.6% of New Yorkers are women and 17.4% are black. On average there is a birth every 4.4. minutes and a death every 9.1 minutes. 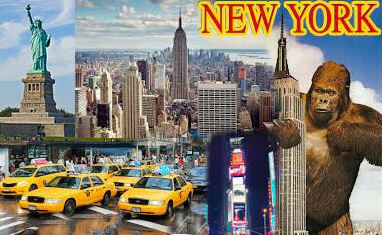 New York was the capital of the United States from 1785 until 1790. It has been largest city in the USA since 1790. Since the 1920s the nickname for New York City has been the “Big Apple”. The city of New York will pay for a one-way plane ticket for any homeless person if they have a guaranteed place to stay. The “New York Post” established in 1803 by Alexander Hamilton is the oldest running newspaper in the United States. Times Square is named after the New York Times. Tourism in New York City is a major industry and there are over 54 million foreign and American tourists each year including day-trippers. One of the big tourist attraction of New York city is the Statue of Liberty which is a giant statue given to America in 1886 by the French. It is visited by 4m people each year. The Statue of Liberty was designed by Gustave Eiffel who also designed the Eiffel Tower. In high winds of 50mph Lady Liberty can sway by up to 3 inches, while her torch can move 5 inches. From the ground to the top of the torch the statue measures 93 metres, and weighs 204 metric tonnes. Football (aka soccer) as we know it today came from a set of rules invented primarily in Britain. Various forms of football existed with very different rules that were created within the British “public school” (private school) system. For example, Rugby School in Warwickshire created rules for their version of “football” that would become the foundation for the modern game of Rugby. However, it was Cambridge University who created the rules that were used by the Football Association when it was created in 1867. Cambridge rules were designed to be simple and focus on skill as opposed to force and heavily restricted the use of the hands for controlling ball. Football is the most popular sport in the entire world. More than 715 million people tuned in to the FIFA World Cup final in 2006 in Germany and there were more than two billion viewers of all the matches in total. If the viewers of the final formed a country, they would be the third most populated country in the world with the total viewers being almost two times the population of China. Unsurprisingly, football players make a lot of money and are some of the best paid sports-people in the world. Cristiano Ronaldo of Real Madrid FC is the highest paid player in the world, earning £292,000 (after tax) a week. David Beckham is one of the most recognisable football players in the world and has created a brand around him, he currently has a net worth of $350 million. The world’s most expensive player is currently Gareth Bale who Real Madrid FC bought for £85 million in September 2013. The largest crowd of any football match was between Brazil versus Uruguay in the 1950 World Cup in Rio de Janeiro. 199,854 people watched the match in the Estádio do Maracanã to see Uruguay win two goals to nil against the host nation. This match shocked Brazil as many of the country’s newspapers had already proclaimed Brazil to be champions before the final. Sheffield FC is the world’s oldest football club that currently still plays. The club was founded in 1857 after two members of a local cricket club wanted to make their casual football matches more formal. Nathaniel Creswick and William Prest founded the club and they initially used their own rules (Sheffield Rules) until later adopting formal Association Football rules. Both men heavily influenced amendments to the rules of the game and made the game what it is today. The football club with the most supporters in the world is Manchester United, with 354 million fans worldwide; the club has been very successful winning the English Premier League 13 times. The next two most supported teams are Barcelona and Real Madrid from Spain. Both teams are fierce rivals and matches played between these two sides are called “El Clásico” with Barcelona currently winning 108 matches to Real Madrid’s 96. The biggest win was by Real Madrid who beat Barcelona 11-1 in a “Copa del Rey” match in 1943.